Disaster struck an Amtrak passenger train in Washington state on December 18, 2017. The Amtrak Cascades passenger train left the rails of the Point Defiance Bypass rail route south of Tacoma, Washington. The train derailed as it rounded a corner at 82 mph, drastically exceeding the speed limit. It careened off of the tracks, sending all twelve passenger cars tumbling onto the highway below. Between the southbound traffic of I-5 and the train’s riders, 100 injuries and 3 fatalities have been reported. Both the victims of the crash and the investigators are still reeling from the unexpected tragedy. As of today, many questions remain. 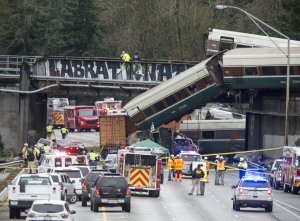 The National Transportation Safety Board leads the effort to shed light on the events leading up to the crash, extracting and analyzing information from the many recording devices installed on board the train. While we await the results of their investigation, many pertinent questions come up. Why was the train traveling at nearly three times the speed limit for its turn? It is possible that the situation made it impossible to slow down normally. However, information from the train’s sensors show that the emergency brake never went off. Why did the emergency brake not engage? Did the engineer do nothing while the train hurled at breakneck speeds towards disaster? Some initial sources point to distraction as the cause of the crash, leading the engineer to neglect proper safety procedure. The engineer was joined in the engine car by a trainee conductor assigned to learning the train’s route. This is standard procedure for Amtrak trains, but it could have distracted him enough to cause a wreck. However, this is not the first time Amtrak trains have derailed due to speeding. In July of this year, an Amtrak train derailed while speeding towards an open drawbridge. Additionally, in 2015, Amtrak 188 went off the rails at twice the 50 mph speed limit. As we await the full results of the investigation, the question of distraction proves to be a chilling one. Perhaps the most unsettling fact of all that the technology to prevent this accident already exists, and was installed on the Amtrak Cascades 501 as it hurled off the tracks. Positive Train Control (PTC) is an automated system that prevents disastrous human error. It consists of sensors that can warn an engineer ahead of time, should they need to lower their speed, account for misaligned tracks, or avoid train-on-train collisions. However, if the engineer fails to properly prepare for oncoming hazards, PTC can automatically engage a train’s emergency brakes. According to Bella Dinh-Zarr, the head investigator of the crash, Cascades 501 had a PTC system, but it was not yet operational. Years before the accident, the mayor of Lakewood raised concerns about the safety of the higher speed rail spur. His major concern was roads crossing the rail line and the potential for train/vehicle collisions. The city of Lakewood sued the Washington State Department of Transportation in 2013 (Lakewood-Lawsuit). They wished to halt the project, until further safety testing and environmental reviews were completed. The lawsuit was dismissed in part because the law preempts cities and towns from regulating rail lines. Amtrak does not have a clean record when it comes to train accidents. It is hard to say when we will know exactly what caused this catastrophe. Many of the victims are still in the hospital, and a detailed recreation of the event may take a year or more to complete. Nonetheless, a disaster of this magnitude does not happen when everything goes as planned. Whether it was the engineer’s error or Amtrak’s neglect, someone must account for their actions. The victims deserve justice for the violence inflicted on them, and for the medical debt now resting on their shoulders. The Law Offices of L. Clayton Burgess is personal injury firm. Our team of personal injury and wrongful death attorneys have over 20 years of legal experience fighting for your rights. We can help with injury claims or wrongful death lawsuits. If you need a railroad accident attorney, contact us today to schedule a free consultation.